An official reveal shouldn’t be too far away. Our spy photographers recently caught a , so it was perhaps inevitable that the coupe version would get spotted soon after. Seen testing on public roads, the facelift is covered by a very thin layer of camouflage masking the bumper, headlights and taillights, much like the GLC prototype we saw last week. It looks practically production ready, but don’t expect any radical design changes from the mid-cycle facelift. At the front are new headlights with redesigned daytime running lights, a new front bumper hiding under the camo and a grille with some minor modifications. At the back, the rear lights feature new graphics, and on closer inspection the rear bumper has received some minor tweaks and the exhaust tips have a different shape. 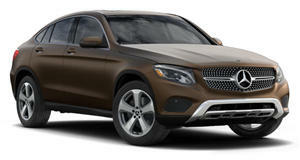 Essentially, the design changes from the GLC facelift look like they will carry over to the Coupe. While the exterior revisions will be relatively minor, more significant changes are expected to be found in the cabin mirroring the Mercedes C-Class facelift. Since the GLC is based on the Mercedes C-Class, expect the updated to feature an all-digital instrument cluster and a larger infotainment display. Mercedes’ COMAND system will remain, but the next-generation model will adopt the company’s new MBUX system. Likewise, engine options for the 2019 C-Class should also carry over to the updated , which means the 2.0-liter turbocharged inline-four will likely get a power bump from 241 to 255 horsepower. Considering the minimal amount of camouflage on the prototype, an official debut shouldn’t be too far away. A public debut at the Paris Motor Show in October seems likely, but it could be revealed online before the show. Sales are expected to start before the end of the year, while deliveries are expected to start in early 2019.